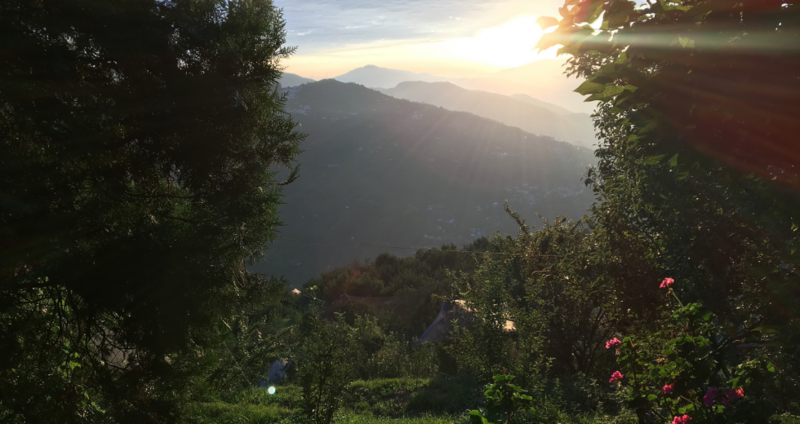 With the proliferation of online travel sites replete with photoshopped landscapes seemingly ripped from the paintings of Rousseau, Seetalvan Orchard, located in the picturesque hills of Kotgarh, certainly can’t be accused of false advertising. 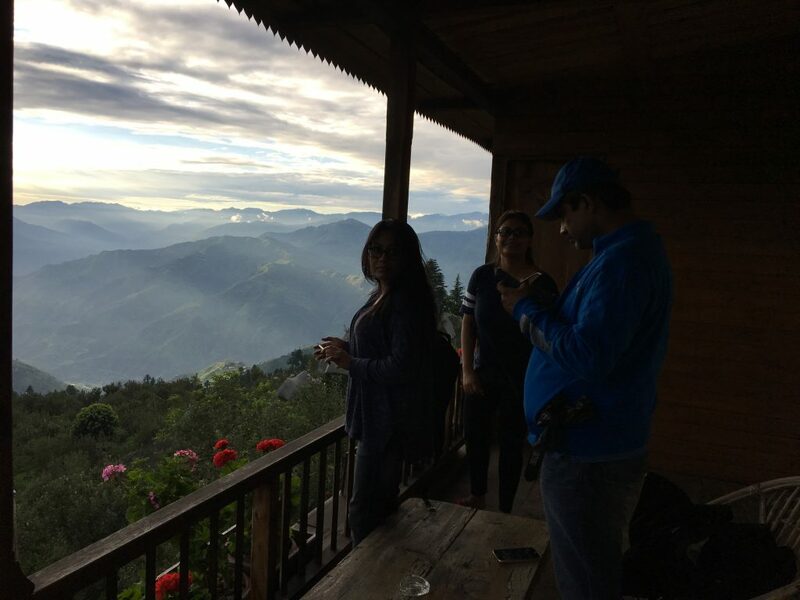 Situated on the ridge of a stunning valley, some three-hour’s drive from Shimla, the resort offers misty views of the Shivalik mountain range – glassy peaks overlooking lush forest. With each of Seetalvan’s eight rooms sighting an unobstructed view of this vista, the sheer visual symphony of this little-known boutique property is nothing less than overwhelming. 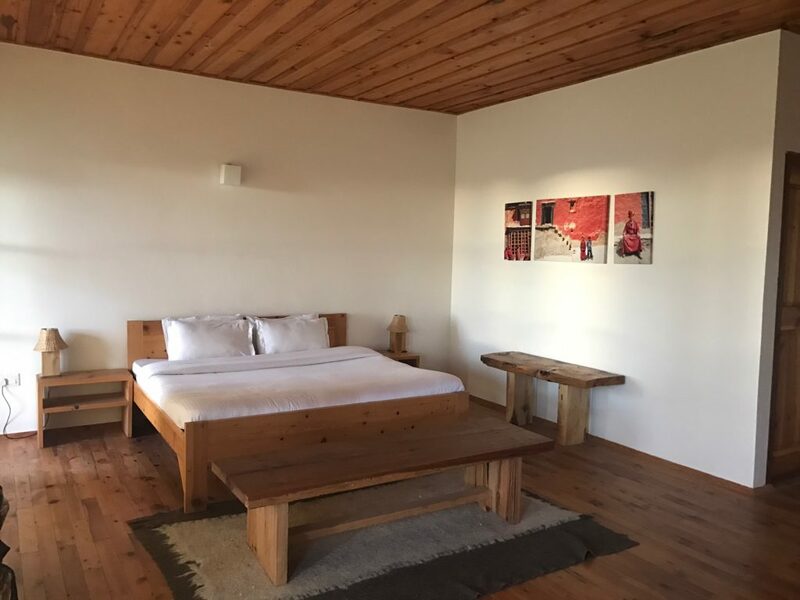 Having spacious rooms made of local wood, rustically but tastefully decorated with tables and benches carved from solid lumber – and with all amenities to boost, including showers with stone floors and modern bathroom fixtures, cozy beds, and ceiling to roof windows with screen doors to keep out pests, Seetalvan marries the experience of a log cabin with the comforts of modernity. The balconies (which are more like terraces, given the ample space) are ideal to watch the sunrise or set over the panoramic natural wonders that surround the property. Having a glass of freshly juiced apple in the morning while listening to birds chirping as the rolling mist lifts one out of the out the ambit of the urban, the experience beguiles one never to want to leave! The same can be said of the staff: from owners, Meenakshi and Rajendra (Raju) Singh Djhina to the house boys, led by manager, Rakesh, one never feels anything but completely welcome at the well-serviced resort on this sprawling estate. Mineral water, chilled or ‘normal’, towels and toilet paper, to name just a few necessities of the foreign traveler, are never in short supply. And most every request is met with a quick response and a smile. The resort has a well-equipped and clean indoor dining area – or one can dine Al Fresco. There is a set menu at dinner, and it is generally quite delectable. Mini-roti’s, served hot in baskets with veg and non-veg delights of classic North-Indian variety are replenished on the table without interruption. Some substitution is possible as we found out – a special egg-curry was prepared for someone in our party one night, which she really found mouthwatering. Both rice and breads are served in ample quantity even though hilly regions are often racked by scarcity. Snacks and lunch items are available a-la-carte during the day, including pizza made in a wood-burning oven (though, understandably, one needs to order this in advance to get the oven fired-up). Breakfast features fresh fruit and orchard fruit juice, each day, preserves and chutneys with bread – all preceding either Indian or Western breakfast, so whether Puri Bhaji or omelet sandwich is your comfort food in the morning, you will not be disappointed. While these fairly standard items are served hot and done well with fresh local ingredients, the tangy apple chutney spiked with chilis from Arunachal Pradesh deserves special mention: spread on crunchy toast, the delightful marriage of sweet and heat is sure to saturate the senses! What makes this property unique is that it wasn’t built at first instance to accommodate travelers. Rather, belonging to the Singh Dhjina family for generations, the fertile step soil had been used primarily to cultivate apples since around 1940. 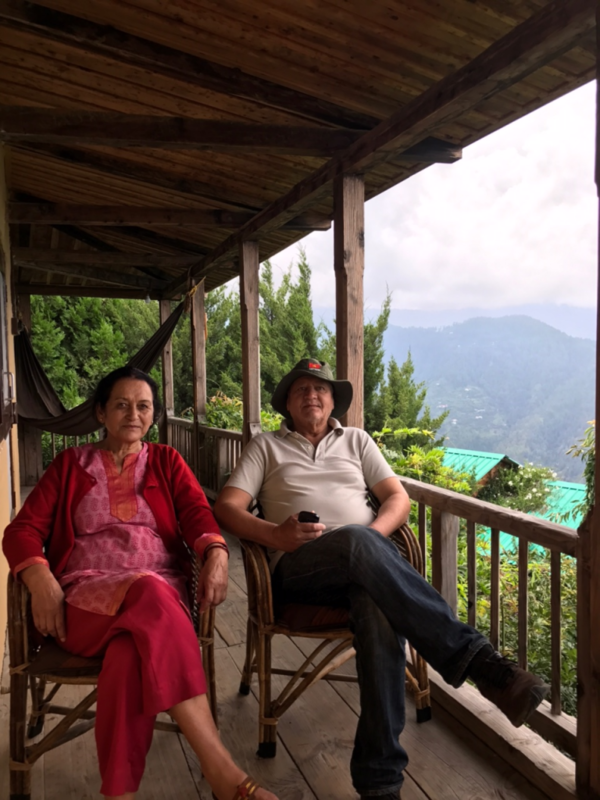 However, the resort was built only a few years back at the behest of the younger generation of the family to meet the growing demand in nature tourism around the old hill stations of British India. “Yes,” adds husband Raju. “We’re primary apple growers but I don’t mind the people.” Meenakshi chuckles and playfully slaps the old man. Today, cultivators in the area grow plums, apricots and cherries. “We even grow Kiwis (sic),” says Meenakshi. “But our main crop is apple. People are growing these other fruits like cherries to get some extra income but the primary crop in these orchards is apple,” she adds. 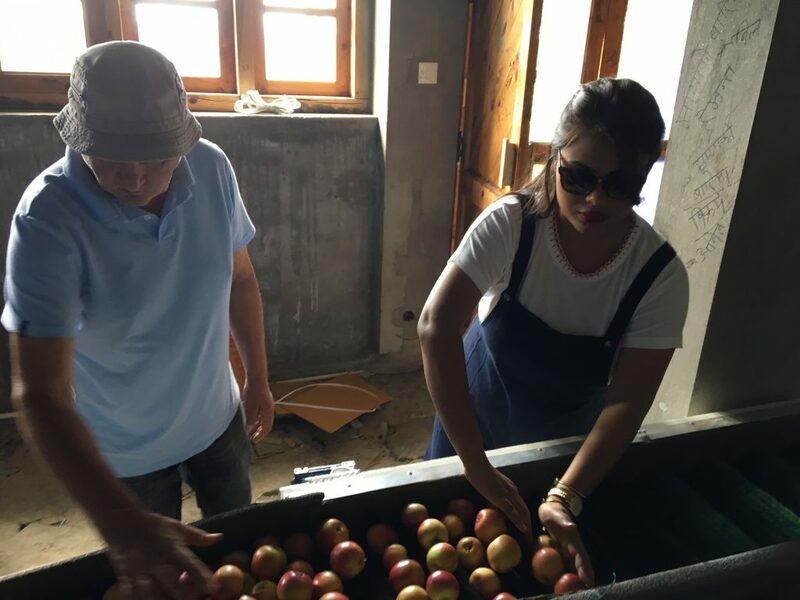 Apples have been the mainstay of the orchards of Himachal Pradesh since the 19th Century, after the East India Company, initially clearing some brush to plant lucrative tea bush seedlings smuggled from China, found the climate was not suitable for the crop. They’d also planted apples, which were green, sour tasting – and mainly used in preserves. It wasn’t until the American, Samuel Evan Stokes Jr., the somewhat wayward son of American Quakers and scion of a prosperous industrialist, found his calling in the hills surrounding the winter capital of the British Raj in Simla, that apple cultivation came into its own in the region. As a young man, Samuel came to India to work at a leper colony much to the chagrin of his parents who’d expected him to follow in the family business, Stokes and Parish Machine company, then the primary manufacturer of elevators in the United States. Stokes’ dedication to the less fortunate endeared him both to the pariahs he served and to the surrounding villagers. He married a local Rajput girl who was likely the first such convert to Christianity, taking the name Agnes. Having inherited a rather handsome fortune from his father, Stokes, now a family man, bought land and began to grow a new strain of apples cultivated in the American state of Louisiana called Royal Delicious. These brilliant red fruit, flesh holding sweet juice, flourished under the climactic conditions of the hills around the British summer capital, and Stokes helped other farmers grow the crop. He also helped in its trade by linking Indians with Europeans. As we discuss the history the of apples in the region, the Singh Djina’s playfully argue over his name – Samuel or Satyananda… It turns out, both are right: After the devastating death of his son, Tara, Stokes adopted the Hindu faith and changed his name to Satyananda. His wife Agnes became Priyadevi. This decision (circular for Stokes’ wife) cut them off from the Christians who’d proudly welcomed Agnes into the fold – but the two were amalgamated into a new community among Indian freedom fighters. Stokes had the singular honour of being the only American member of the All India Congress Committee (AICC) of the Indian National Congress, representing The Punjab along with Lala Lajpat Rai. He was the only non-Indian to sign the Congress Manifesto in 1921 and was jailed for sedition. The Earth and the fruits of it had transcended nationalities, crossed borders – it is a legacy not lost on the Djina’s. “Many people of this area have foreign blood running through their veins,’ says Raju, a former student of history. “Just like the red apples, which have come from abroad, so too are the people of this land, their Desi blood mixed with that of outsiders, thriving in their diversity.” Meenakshi mentions the Indians living in Kotgarh bearing the name Stokes. They are proud descendants of the father of the industry. 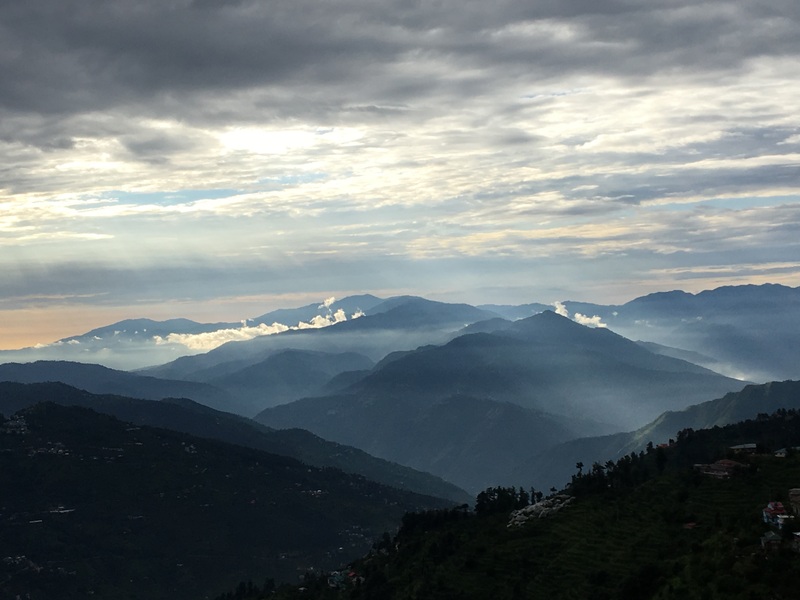 It is more than a mingling of bloodlines for which this place is famous: Kotgarh thrives in the paradoxical dichotomy of the parochial and global both in land and folk. For the urbanite, the singing of birds rather than ringing of phones, the sweet scent of fruit rather than garbage, and mist rather than smog in one’s lungs – combine to form an antidote to the woes of the rat race. For this is a place, amidst old world charm and modern comforts, where time itself seems to ease up. In the end, Seetalvan Orchard is a refuge within a vacation spot: somewhere to just be.